Scene 1: Well known Actor ‘A’ was irritated by the opposition to his movie by religious group ‘X’. Frustrated by the opposition actor ‘threatened’ to leave India and move to some foreign country. Scene 2: Well known Actor ‘B’ was irritated by the opposition to his movie by religious group ‘Y’. He didn’t speak anything about that issue. Months later in an interview he told that his wife is ‘suggesting’ to leave India and move to some foreign country. According to Present days Tolerant India’s logic Actor ‘A’ and ‘B’ should be considered anti – national and traitors. Wait a minute…. Actor ‘A’ = Kamal Hassan; Religious group ‘X’ = Muslim fundamentalists. Actor ‘B’ = Aamir Khan; Religious group ‘Y’ = Hindu fundamentalists. Do you still think both Actor ‘A’ and ‘B’ are anti – national traitors? If your opinion changes once you know the names of actors then it indicates your love and hate for particular religion. Nothing patriotic in that! Discussing Intolerance in the society based on Aamir Khan’s Wife’s comments is absurd. With the rise of 24x7 news channels and social media most of the discussions will be on these absurd and mundane issues. The ruling parties will be very happy to see people fighting over trivial issues and forgetting the government’s failures! Aamir Khan and Kamal Hassan are actors, have directed few movies and that’s it. Our love or hate to those persons should be limited to their movies. Why should someone consider them as real life heroes and give undue prominence to them? Aamir Khan can’t be called patriotic because of his role in Sarfarosh and Mangal Pandey; at the same time he can’t be named anti hindu because of his role in PK! 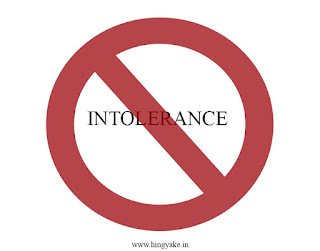 Even people who are speaking up against growing intolerance have not branded india as intolerant. Growing intolerance is not equivalent to Intolerant India. But can one deny the fact that growth of intolerance is on the rise? Congress ruled this country for a long long time. Were there not any protests against the Congress? There were protests, and most of the pro – people protests were organized and carried forward by the progressives, dalits intellectuals and leftists. The Hindu rightists and their supporting political parties protested only when there was some religious element in it. In Karnataka at present there is Congress government. Progressives, dalits, intellectuals and leftists have protested against Siddaramaiah’s government. But I have never heard anyone from this state government asking the protestors to leave the state or country, they have never called these protestors against state government anti – national traitors. But is it same with Modi’s BJP government in the centre? Speak a word against BJP or Modi, you will be named as Congress chamcha! You will be named anti national! You will be named traitor! Responsible ministers say that these people are paid by congress to make such statements! The Politicians of BJP will ask those who oppose BJP or Modi to leave India and move to Pakistan! I have a doubt that these Politicians of BJP are actually funded by Pakistan Tourism Department! Social media will be buzzed with all type of images and posts condemning the statement! And our people who not even a single time protested against any government, show their patriotism by sharing half baked and half truth posts without thinking. Their minds are probably blocked by the words of our great leaders. If this is not growing intolerance what is? The writers, academicians, scientists, directors and even the army personnel have returned the awards as a form of protest to various issues. They are named Congresswalas, they are named traitors, they were called undeserving candidates for those awards. Even there was a protest headed by Anupam Kher against this award wapsi. Eminent Kannada writer S.L. Bhyrappa and director Nagabharana spoke against this award wapsi. By the way Anupam Kher’s wife is BJP member. Does it make Anupam Kher BJP chamcha? Does S.L. Bhyrappa and Nagabharana paid by the BJP to speak against this award wapsi?